e-city.gr > Thessaloniki > Byzantine Years 395 A.D.
Home Page > Sights > Byzantine Years 395 A.D. When the Roman empire began to decline, Thessalonica became the base of operations of Big Konstantinos. In 324 A.D. Konstantinos was installed with his big army of 120.000 men in the city, after he manufactured a new big harbour. 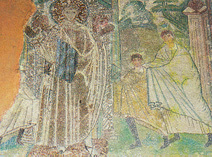 After he prevailed in the war, M. Konstantinos as an autocrat, with Christianity as an official religion , founded in the old colony of Megareon Byzantium (in Propontida) the new capital of the Romanian state, Istamboul, or New Rome. From then on Istamboul and Thessalonica will constitute the main poles of growth of the Byzantine empire for a period of over 1.000 years.